The quality of Tamlin’s timber frame structures, which are part of our “export house packages”, is one of the reasons why Tamlin is considered one of the leaders in the industry. Tamlin has its own factory where we have complete control over maintaining the high quality of our timber work. Tamlin’s timbers start with the best Douglas fir from the west coast of British Columbia, Canada. Timbers are typically the highest grade of structural Douglas fir (#1 Appearance), and also have the “heart center” or center of the tree removed, so the amount of checking and twisting is reduced considerably. Tamlin also provides a combination of solid timber or “glulaminated” Douglas fir timbers to suit your preferences, but also to balance the cost and engineering requirements for the “structure” of your home. We then integrate our post & beam structure into your custom home. These individual precut timber pieces, which might be 6×6, 8×10, 10×10, 12×20 or larger, are first graded, planed, and cut to length. Each timber is then notched and test fit. Sections of the structure are actually “stood up” in place at the factory. Components are labelled according to the 3D drawings that are used for re-assembly on site. Final hand sanding and factory pre-staining ensure the highest quality of finish. All the connection details that are engineered, must also “fit” into prefabricated panelized walls, and/or engineered roof systems so significant attention is given to details. Factory precut wall panels are meticulously drawn up and these shop drawings are checked with foundation drawings to make sure all the walls line up on site. This work can only be performed by the most experienced designers. The key to success is having all the “drawing work” under the responsibility of one experienced company. Permit drawings, construction drawings, engineering coordination, and final “shop” drawings are completed by Tamlin’s experienced in-house architectural technologists who also create easy to read on-site wall panel drawings, and timber frame 3D plans, with the carpenter in mind. Recently another prefabricated timber home package was shipped from our factory just outside Vancouver, Canada to Woodland in Washington State close to the Washington Oregon border. This home was 3870 square feet. It featured a timber great room with vaulted ceilings and custom timber bents, western red cedar board & batten siding, and other timber covered decks and porch areas. The home owner was coordinating this building project himself. After visiting our showroom and facilities, he was extremely impressed with the hands-on quality of timber work which helped move this project quickly from the preliminary design stage (the stage where Tamlin customized the home plans). After Tamlin quoted the cost of the “shell package ” and the owner confirmed the substantial cost and time savings of the project, a close working relationship evolved, and the house package was recently shipped duty free directly to the owner’s job site where the assembly is going smoothly. Our structural and decorative timber components are factory built and included as part of your custom house package. 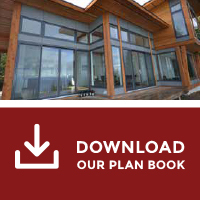 A typical export house package will include floor system, premade wall panels, precut timber frame, roof system, exterior doors, windows, siding, decks and more. All of this is shipped right to your building site direct from our factory in Canada. There is a huge cost savings of 30-40% with the current exchange rates for shipping to the USA.